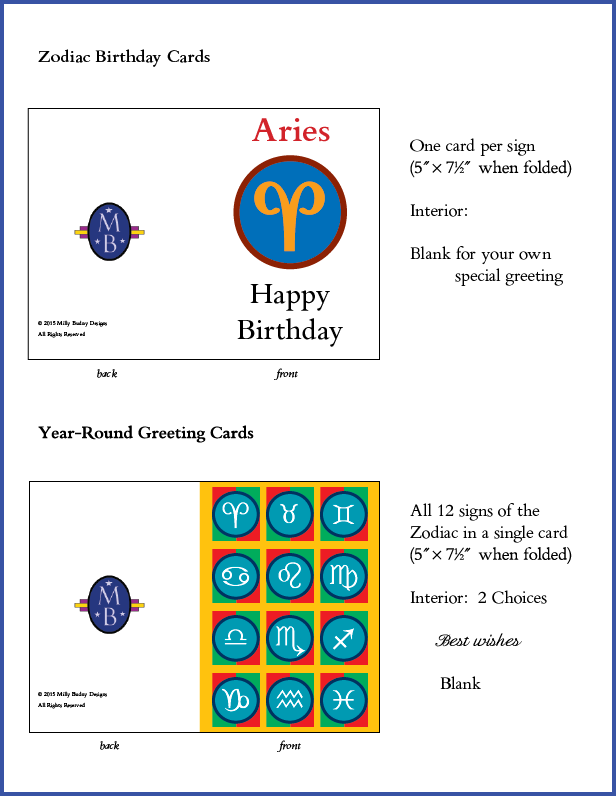 Celebrating the new version of our copyright font Bembino, now with its especially requested Zodiac and Astrological Signs (and other elements), we have been given generous permission for a special Promotional Offer for the Greeting Cards designed expressly by Milly Budny Designs. Wishing to use the font, and experiencing its creation from the Get Go (see our Director’s Memoirs, in progress), the artist/creator/designer of Milly Budny Designs especially requested the zodiac and astrological signs for that font. She says that she loves celebrating birthdays, friendships, and celebrations in general as well as particular. Cards, real cards — the kind that you can have and hold (no offense to any other kinds) — can have a good place in these recollections and celebrations. The request for the zodiac signs in Bembino sought to blend all the design for the text on the cards into a complementary whole. 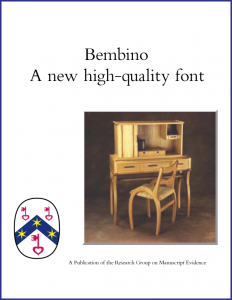 After all, those are the principles and the practices of our multilingual font Bembino, designed for different languages and styles of text to “live in harmony on one page”. Why not apply them to everything that we design? Indeed, why not. Love it when it works. 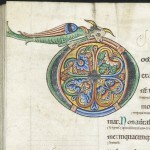 And so, approaching the 2017 Total Solar Eclipse (on 21 August) and the Autumnal Equinox (on 22 September), we celebrate the seasons with reasons and greetings. 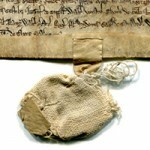 By special and generous arrangement with the designer (see Her Page), all profits from this promotion will be donated to the Research Group on Manuscript Evidence. Which is your sign? Every one has its place here. 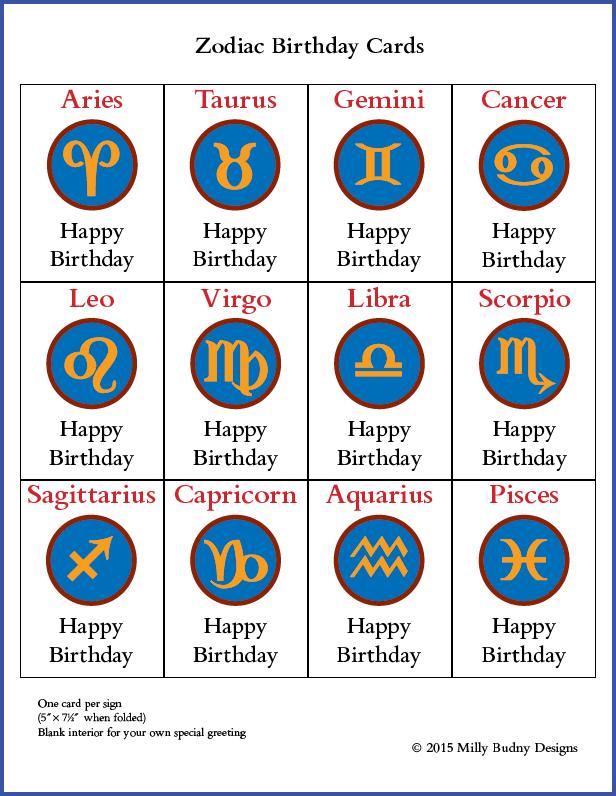 The designs recognize every Birthday Sign. They also celebrate the full set of signs in a universal Greeting Card. 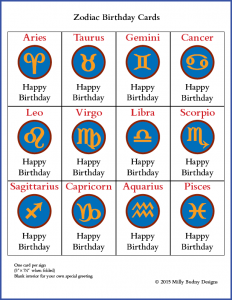 Thus, they feature the individual Birthday Signs and also embrace the full set of Signs in a year-round Greeting Card. Something for everyone, and for every time of the year! Which do you choose? One or more? Maybe a full set, for all your Friends and Family and many Occasions, Birthdays and Best Wishes Opportunities included? A Special Offer deserves a Special Offer. 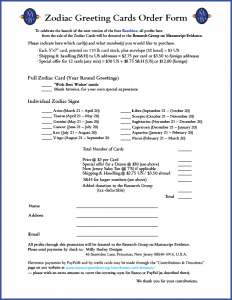 The 5″ × 7″ cards are printed on 110 lb card stock, plus envelope (32 bond). The artist selects and ensures quality-control, so that you can expect well-printed cards. Good greetings deserve good expressions, don’t you think? Usually, the cards sell for $4.00 apiece, plus (where applicable) shipping and handling, and (in New Jersey, our home base) sales tax. For this celebratory Promotion, their special price is $3.00 apiece, or $30 per dozen — in any mix of birthdays and/or all-year greetings. Remember, the profits go to our organization! The set of zodiac signs in our font Bembino were designed by special request for the astrological signs. With those additions to the font, the cards were designed as a full suite by Milly Budny Designs. 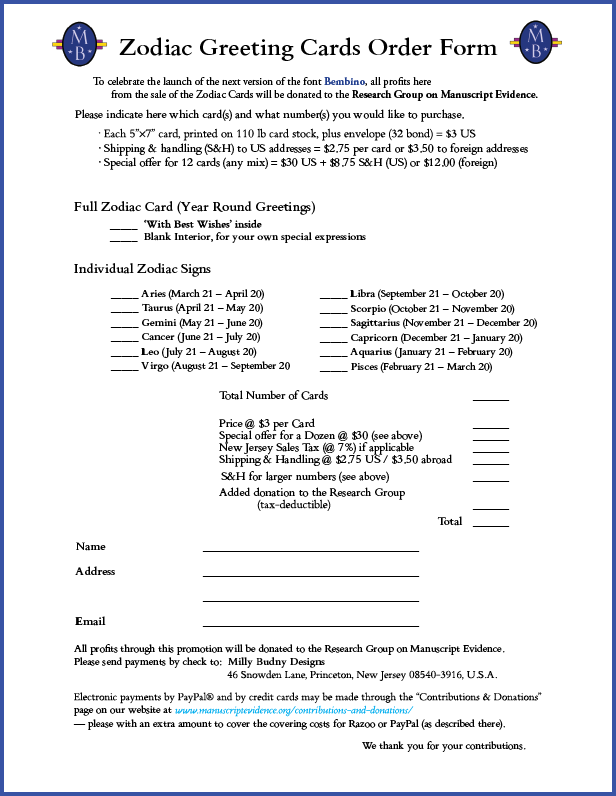 Information about ordering the them can be found on their Zodiac Cards Form for the Research Group. 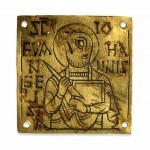 Also, you might contact director@manuscriptevidence.org. By arrangement, all the profits from this promotional offer — and not only some part of the proceeds for the sales — will be donated to the Research Group on Manuscript Evidence, a recognized 501(c)(3) nonprofit organization. Our Home Page describes our Mission for educational purposes. Also, your Contributions and Donations are easy to offer, both in funds and in kind. There are many ways to help us, as an organization powered by volunteers. Because the organization does not have buildings, paid staff, and a large infrastructure, your donations may directly support our organizational running costs and minimal fund-raising expenses, and mainly our program activities. Lean but not Mean! 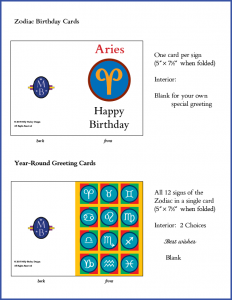 This collaborative generosity has led, among other gains, to the Promotional Offer for the especially designed Zodiac Cards. We thank the designer for contributing their sets to our cause. Here we see them from the outside, Front-and-Back. Pretty, don’t you think? Enjoy! Please contact us with your questions, requests, and suggestions. We look forward to your orders. Sign on!